The Classroom Clique, a group of really amazing teachers, is celebrating teachers this week with a blog hop filled with freebies, amazing prizes, and tips that are sure to make your year end well! Make sure to stop by each blog in the hop, gather the key word, combine them to make a sentence (the words go in order), and download the freebies (and leave feedback to earn TPT credits for the site-wide sale!). Summer slide is REAL! So the question is, how do you get students to actually study over the summer? 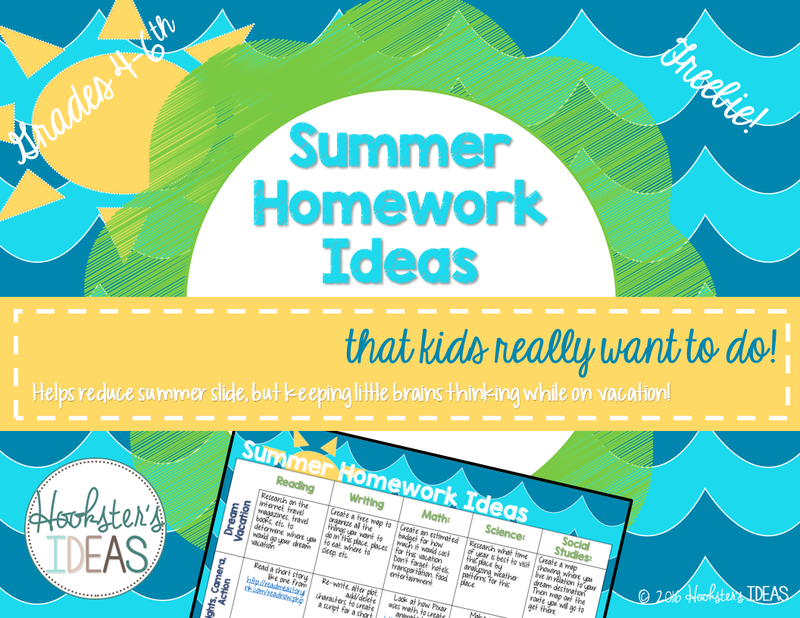 I have worked in schools where they give hefty packets of worksheets to complete over the summer and offer a pencil or some other incentive that usually does not motive them to do the work. What I have seen over the years is that these packets generally end up in the trash, are partially completed, and frankly, just waste a bunch of resources. Motivation is key here and I know I wouldn't be interested in completing a packet of work over the summer! Giving students ideas of things they can do over the summer that incorporate skills they have learned during the year, can be done with friends, and gets them moving is what will help keep kids learning over the summer and help reduce the need for remediation the first few months of school. I have created an example of this for fourth through sixth graders. The idea is to give kids choice, the thumbs up to use technology, incorporate play, and make learning fun! I have selected three big themes that are each a week long and incorporate reading, writing, math, science, and social studies. Some kids have jam packed schedules during the summer, while others are more laid back. Whether your students are travelers or not, this is a great way to help them dream big, apply skills learned in a real-world way, avoid the dreaded "I'm B-O-R-E-D! "statement, and have a lot of fun. They can all be extended to go more in depth, but this is a great launch into this kind of thinking and I highly encourage your students to find one and expand on this idea! Click here to get it for free. Don't forget to leave feedback to earn credits towards the big TPT site wide sale for Teacher Appreciation Week this week. The last few weeks of school are often the hardest. You have report cards, student placement cards, RTI wrap-up, packing your room, testing, parties, performances, promotion ceremonies, and the list seems to go on an on. I get it. So, here are some tried and true tips on how to wrap up the year without having to increase your blood pressure meds! Take a deep breath and know that this too shall pass. Summer will come and you will be just fine! Delegate, delegate, delegate. You know those students who have been asking you what they can do all year long to help. Well take them up on it. Kids LOVE to help! But I warn you on this. Choose wisely or you will make more work for yourself. Don't just pick kids that are willing to help, but choose ones that are willing to do what it takes to get the job done correctly the first time. Once you have those student helpers, make a to-do list on the white board in the morning. Assign a student or two each task and mark when it needs to be done by. They can work on that when they finish their work, at recess, or if they are at school early in the morning. When students are working on fun, end of the year activities like memory books, get some work done! Use every minute you have to get something done, so you aren't there until 8 pm every day. Don't feel guilty. You have worked hard and those kids have worked hard and deserve some structured time to themselves. Now write down this word and hop over to the next blog. Keep track of all of these key words so that you can enter to win the prizes above! Click on the picture below to get to the next blog. After you complete the blog hop and gather all the key phrases, click the Rafflecopter link (below) on any of the blogs in this hop and enter the key word sentence to be entered in the raffle of these prizes. Unique Gifts for Valentine's Day or Other Special Days for Kids and Adults Alike! Before You Do Anything Crazy, Read On! © 2015 Hookster's Ideas. Ashleigh Template designed by Georgia Lou Studios All rights reserved.